Rail fares are going up again. Every time this happens, talking heads on the news suggest that a re-nationalised railway would be cheaper. Is this true? That is, of course, an impossible question to answer. It is undeniable that private companies now take profits that would otherwise have been returned to the Treasury under a nationalised system. But there is some data to crunch – There’s some data I’ve located with the help of @jrothwell (he blogs here) and @welsh_lisa2 in the House of Commons library. This sets out rail fare increases in real terms since the late 80s, using the contribution of rail fares to RPI. I don’t think it’s too erroneous to assume that this is an okay proxy for an inflation-corrected comparison of the average change in rail fares. Because it’s based on a comparison of contribution to RPI with a 1987 baseline, the data isn’t in intelligible units – it’s all comparative. This data shows a 42% increase in the real cost of rail fares from 1987 to 2011: this seems like a bad thing. 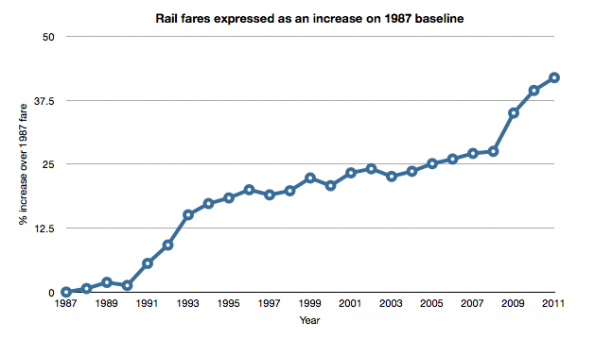 This graph shows how rail fares increased over time. 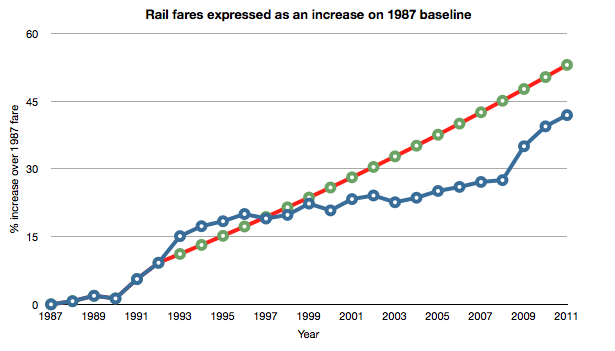 It shows the percentage increase on the 1987 fare for each year (including the 42% increase over 1987 fares in 2011). As the new red line shows, had fare increases continued at the pre-nationalisation level, they would’ve ended up higher: they would be 73% higher than the 1987 equivalent. 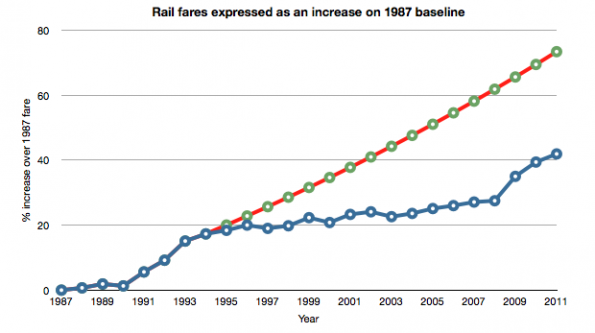 That is, fares still end up higher in real terms than they actually did: in this scenario, the 2011 fare is 53% higher than the 1987 equivalent. It would be great to have some pre-1987 data to see if that suspicious looking flick up in 1991 is really unusual, or just part of the pattern of the background picture: certainly if the 1987-1990 trend had continued, fares would hardly have increased. Combined with the above data, this answer in Hansard from Norman Baker suggests that the change from 1980 to 1986 was of the order of 6%. If we assume a 1% year-on-year increase, as that figure suggests, then the predicated and actual fare increase from 1987 to 2011 are pretty much equal. Bearing in mind all of the above, I’m not sure it’s fair to say that privatisation has driven up passenger fares, even if some of the revenue is now siphoned off to private profit rather than being invested in public services. Add this decrease in the rate of increase of fares to the indisputable data showing that passenger numbers have risen, passengers satisfaction ratings with both trains and stations have risen, and delays have decreased considerably, and suddenly privatisation seems like it might not have been the disaster we’re often lead to believe it was. Of course, this is an extremely simplified view of things. I’m ignoring the complexities of the timing of various changes, I’m ignoring the government subsidies that have happened even under the privatised system, I’m ignoring the added jeopardy of train operating companies handing back franchises and leaving the government to pick up the pieces, and I’m ignoring the potentially dubious morality of selling off national infrastructure. I’m not left with an overwhelming sense that privatisation is the best thing since sliced bread – or even that it was the right move – but I think that perhaps the waters are a little muddier than some would have us believe. And I’m going to stop being geeky now, and resume normal service…! This 1,733rd post was filed under: News and Comment, Politics, Public Transport, Trains.